Spontaneous arthritis in the KRN transgenic mouse (K/BxN) model is due to the autoreactivity of the transgenic TCR and subsequent induction of autoantibodies directed against glucose-6-phosphate isomerase. These autoantibodies transfer clinically apparent arthritis into most recipient mouse strains and systemic catabolism of the transferred Abs attenuates paw swelling. Although mice deficient in the common γ-chain of the FcγR did not show clinical synovitis after receiving K/BxN sera, erosive lesions in the bone still developed. Further analysis demonstrated that FcγRII−/− mice manifested accelerated arthritis whereas the FcγRIII−/− mice had a more slowly progressing arthritis. Paw swelling required FcγR expression by bone marrow-derived cells and mast cells substantially contributed to the acute phase of paw swelling. In the K/BxN serum transfer model of arthritis, there is a clinically apparent acute phase, which is modulated by FcγRII and FcγRIII, and a subacute component, which results in bone erosion, even in the absence of FcγR signaling. Spontaneous severe arthritis develops in KRN TCR transgenic mice that carry the IAg7 MHC class II allele (K/BxN) (1, 2). This model is similar to human rheumatoid arthritis (RA)3 in that both are chronic symmetric joint diseases with pannus formation, and destructive bone and cartilage erosion of predominantly the distal joints. Arthritis in this model has been shown to be dependent on MHC class II specificity and transgenic T cells to initiate disease, and B cells to secrete pathogenic Abs that maintain disease (1, 2, 3). These autoantibodies induce arthritis upon transfer to most naive syngeneic and allogeneic hosts (2). The factors required in the development of paw swelling in this model include the presence of neutrophils, the alternative complement pathway, IL-1 signaling, and FcRs (4, 5, 6, 7, 8). A recent genetic screen for elements associated with this arthritis revealed high logarithm of odds scores for a region on chromosome 2 centering on the C5 locus and a broad region on chromosome 1 (4). This area on chromosome 1 contains several loci related to the family of FcRs including FcεRI and FcγRII. Genetic mapping of collagen-induced arthritis in a cross with nonobese diabetic (NOD) and C57BL/10 mice also localized associated gene regions encoding C5 and FcγRIIb (9). However, in the K/BxN model, the amount of serum transferred to FcγRII−/− mice was reported to influence the development of joint swelling similar to that of wild-type controls (4). We previously reported the lack of paw swelling in mice deficient for the common γ-chain of the FcR (FcγR) following transfer of serum from arthritic mice (5). To further analyze the influence of FcR family members in the development of this arthritis, we have injected mice lacking FcγRII or FcγRIII with K/BxN serum and found that the FcγRIII-deficient mice had markedly diminished paw swelling. In contrast, the transfer of autoantibodies into mice lacking FcγRII resulted in an accelerated onset and severity of arthritis. Using bone marrow chimeras, the presence of paw swelling was associated with the FcγR expression of cells that arise in the bone marrow and not joint-associated tissue. Furthermore, mast cell-deficient mice had markedly attenuated synovitis, suggesting that these cells are also involved in the inflammatory cascade in the joints of affected mice. KRN TCR transgenic mice were a kind gift from Drs. D. Mathis and C. Benoist (Harvard Medical School, Boston, MA) and the Institut de Génétique et de Biologie Moléculaire et Cellulaire (Strasbourg, France) (2) and were maintained on a C57BL/6 background (K/B). Arthritic mice were obtained by crossing K/B with NOD/Lt (N) animals (K/BxN). Progeny bearing the Vβ6 transgenic TCR were identified by cytofluorometry of PBL using anti-CD4 PE (Caltag Laboratories, Burlingame, CA) and anti-Vβ6 FITC (BD PharMingen, San Diego, CA)-labeled Abs. C57BL/6, BALB/c, WBB6F1, WBB6F1-KitW/KitWv, FcγRIII−/− (C57BL/6 background) (10), β2-microglobulin (β2m)−/− (BALB/c background) (11), CD1−/− (BALB/c background) (12), Tap-1−/− (C57BL/6 background) (13), (C57BL/6J × 129S1/SvImJ)F2, 129/Sv, and NOD/Lt mice were purchased from The Jackson Laboratory (Bar Harbor, ME). FcγR−/− and FcγRII−/− mice were a generous gift from Dr. J. Ravetch (Rockefeller University, New York, NY) and provided by Dr. H. Tighe (University of California, San Diego, CA) (14, 15). Tail samples of four FcγRII−/− mice from our colony were analyzed for 84 genome-wide polymorphic microsatellite markers (Charles River Breeding Laboratories, Troy, NY). In these mice, 38.95–40.70% of the polymorphisms were associated with the C57BL/6 strain as compared with 129/Sv. Mice were bred and maintained under standard conditions in the University of California, San Diego Animal Facility that is accredited by the American Association for Accreditation of Laboratory Animal Care. All animal protocols receive prior approval by the institutional review board. Adult mice were lethally irradiated with 800 rad. Bone marrow cells harvested from the femurs and tibia of donors were washed in serum-free medium and counted. The recipients were injected with 107 cells in 100 μl of serum-free RPMI 1640 i.v. After 8 wk, the mice were checked for reconstitution by fluorocytometry. All FcγR−/− that received C57BL/6 bone marrow had >99% of the peripheral F4/80+ (Serotec, Oxford, U.K.) mononuclear cells stain for CD16/32 (BD PharMingen), whereas the level of CD16/32 staining dropped to <40% in the C57BL/6 recipients of FcγR−/− bone marrow. Arthritic adult K/BxN mice were bled and the sera were pooled. Recipient mice were injected with 100–200 μl i.p. as indicated in the figure legends on days 0 and 2. In the chronic inflammation study, mice were injected with 150 μl of pooled K/BxN sera on days 0 and 2, and then were given a series of six more injections of 50 or 100 μl to perpetuate the inflammatory stimulus when paw swelling was subsiding on days 18, 21, 32, 35, 53, and 56. These animals were sacrificed after 70 days. For each swollen paw, 1 point was given, resulting in a maximum score of 4 per mouse. Ankle thickness was measured with a caliper (Manostat, Herisau, Switzerland) in millimeters. Bone marrow cells were harvested from the femurs and tibia of donors and cultured in RPMI 1640 with 10% FCS (Omega Scientific, Tarzana, CA), 1% penicillin/streptomycin, 0.1 mM nonessential amino acids, 5 × 105 M 2-ME, and 3 ng/ml IL-3 (BD PharMingen) for 6 wk, serially monitoring the cultures until they were >95% pure by toluidine blue staining. The recipient W/Wv mice were injected with 107 cells in 100 μl of RPMI 1640 i.v. After 6 wk, the mice were injected with pooled K/BxN serum. Whole knee joints and hind paws were fixed in 10% Formalin, decalcified, trimmed, and embedded. Sections were prepared from the tissue blocks and stained with H&E or toluidine blue (Comparative Biosciences, Mountain View, CA and Biomedical Testing Service, San Diego, CA, respectively). Lapine glucose-6-phosphate isomerase (G6PI) type IV (Sigma-Aldrich, St. Louis, MO) was coated on high-affinity 96-well ELISA plates (Costar, Cambridge, MA) at 10 μg/ml in PBS. Plates were then blocked with PBS/1% BSA. Anti-G6PI IgG1 was detected with alkaline phosphatase-labeled goat anti-mouse IgG1 (Southern Biotechnology Associates, Santa Cruz, CA) followed by incubation with p-nitrophenyl phosphate substrate (Sigma-Fast; Boehringer Mannheim, Mannheim, Germany). Absorption was measured at 405 nm. For IgE measurement, serum samples were pretreated with protein G-Sepharose beads to remove the effect of competing of IgG Abs for Ag and then diluted in blocking buffer. Bound murine IgE was detected by biotinylated rat anti-mouse IgE (R35-92; BD PharMingen) and streptavidin-peroxidase (Zymed, South San Francisco, CA) followed by TMB substrate (Kirkegaard & Perry Laboratories, Gaithersburg, MD). The reaction was stopped with 1 M phosphoric acid and absorbance was read at 450 nm. The pool of injected sera was used as standards, arbitrarily set at 106 U of IgG1 and 100 U of IgE undiluted. Data were analyzed using DeltaSOFT II version 3.66 (Biometallics, Princeton, NJ). 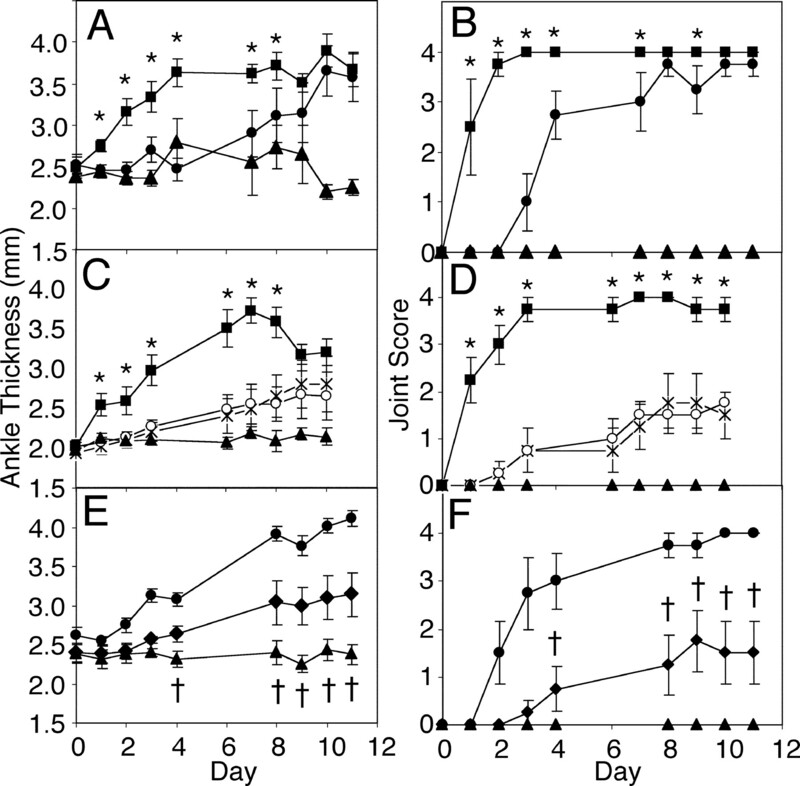 Pooled (K/B × N) and normal BALB/c sera were transferred to BALB/c and β2m−/− (BALB/c) mice. All mice that received the pooled KxB/N sera initially developed arthritis, but the synovitis in β2m−/− mice quickly resolved (Fig. 1⇓A). Similar to previous reports, the ankle thickness never returned to baseline or to that of mice that received control BALB/c serum despite the absence of visible erythema or swelling (1). Mice that were deficient in the expression of the transporter for Ag presentation (TAP) were tested in a separate experiment and did not show a similar rapid resolution of paw swelling (data not shown). Transfer of arthritis resolves quickly in β2m−/−mice and correlates with anti-G6PI IgG. Adult K/BxN and BALB/c mice were bled and the sera were pooled. A, Adult BALB/c (•, ○), and β2m−/− (▪, □) mice were injected on days 0 and 2 with 200 μl of pooled K/BxN (•, ▪) and normal sera (○, □) i.p. Arthritis was clinically scored and ankle thickness was measured with a caliper. The means of four mice per group ± SEM are shown. B, Adult BALB/c (•), CD1−/− (▴), and β2m−/− (▪) mice were injected on days 0 and 2 with 200 μl of pooled sera i.p. Arthritis was clinically scored and ankle thickness was measured with a caliper. The means of three to four mice per group ± SEM are shown. C, The mice were bled before injection and then on days 3 and 13 after injection. Serum anti-G6PI Ab titers in injected BALB/c (▪), CD1−/− (▨), and β2m−/− (□) were determined by ELISA as described in Materials and Methods. Mean values + SEM of three to four mice per group are shown. The IgG1 on days 3 and 13 were significantly less in the β2m−/− mice than in the other two groups (∗, p < 0.05 by Student’s t test). The data are representative of two independently performed experiments. β2m is a soluble domain for several proteins, including MHC class I, CD1, and neonatal FcR (FcRn). We suspected that the deficiency of FcRn in the β2m−/− mice was causing a rapid clearance of the autoantibody (16). Hence, BALB/c, CD1−/− (BALB/c), and β2m−/− (BALB/c) mice were injected with pooled K/B × N sera (Fig. 1⇑B). The sera of the injected mice were checked for the presence of anti-G6PI Abs before the transfer of serum, at the peak of the arthritis, and after the arthritis had resolved in the β2m−/− mice. The β2m-deficient mice had significantly less measurable anti-G6PI IgG at 3 and 13 days after injection than the other two groups (Fig. 1⇑C). However, these mice did not have less Ag-specific IgE, as this catabolism pathway is FcRn independent. We previously described our inability to transfer KRN arthritis to FcγR−/− mice (5). To extend these studies, we injected FcγRIII−/− and FcγRII−/− mice as well as wild-type controls with pooled K/BxN sera. FcγR−/− mice again did not show any paw swelling. The FcγRII−/− mice developed severe accelerated arthritis, whereas the paw swelling that developed in FcγRIII−/− mice was markedly attenuated with delayed kinetics (Fig. 2⇓). Transfer of arthritis by K/BxN sera is predominantly FcRIII dependent. The following groups of adult mice were injected on days 0 and 2 with 100 μl of pooled K/BxN sera i.p. : A and B, C57BL/6 (•), FcγR−/− (▴), and FcγRII−/− (▪); C and D, 129/Sv (cross), (B6 × 129)F2 (○), FcγR−/− (▴), and FcγRII−/− (▪); E and F, C57BL/6 (•), FcγR−/− (▴), and FcγRIII−/− (♦). Arthritis was clinically scored and ankle thickness was measured with a caliper. The means of four mice per group ± SEM are shown. Days when FcγRII−/− and FcγRIII−/− mice have significantly greater paw swelling than C57BL/6, 129/Sv, (B6 × 129)F2, and FcγR−/− mice are noted (∗ and †, respectively; p < 0.05 by Student’s t test). In an attempt to produce chronic inflammation in the passive transfer model, FcγR−/− and C57BL/6 mice were injected with 150 μl of K/BxN serum on days 0 and 2 and were then reinjected with smaller doses to re-establish clinical arthritis each time the paw swelling of the C57BL/6 mice had subsided. At the end of 72 days, the mice were sacrificed and the knees were examined. Shown is an example of a normal C57BL/6 mouse knee (Fig. 3⇓, A and B) at the site where the cartilage meets the bone, which is sometimes referred to as the “bare area.” The cartilage is smooth and the synovium is a single-cell layer. In contrast, the C57BL/6 K/BxN sera-treated mice showed a proliferative synovial response and an inflammatory infiltrate (Fig. 3⇓, C, D, and G). 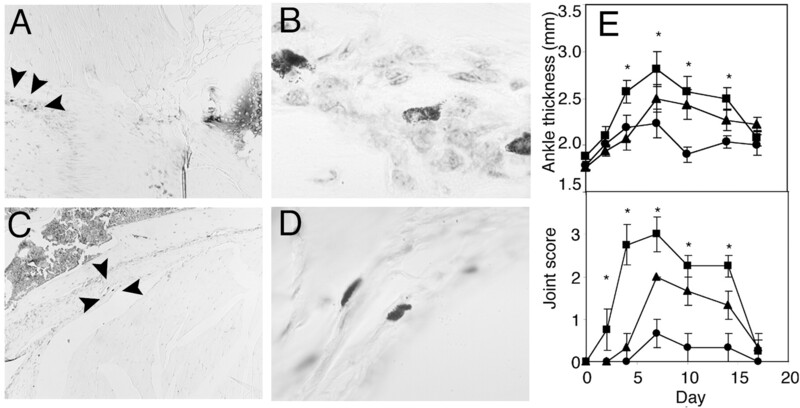 Despite the absence of clinically apparent arthritis, the FcγR−/− mice also had thickened hypercellular synovium, bone erosions, and cartilage damage but to a lesser extent (Fig. 3⇓, E, F, and H). Erosive disease in FcγR−/− recipient mice. Four adult C57BL/6 and FcγR−/− mice were injected with 150 μl of pooled K/BxN sera on days 0 and 2 and were then given a series of six more injections on days 18, 21, 32, 35, 53, and 56 of 50 μl or 100 μl to perpetuate paw swelling. These animals were sacrificed after 70 days. Hind paws were fixed in Formalin, joints were decalcified, and embedded, and tissue sections of knees were stained with H&E. Shown is an example of a normal C57BL/6 mouse knee (A and B) at the site where the cartilage meets the bone, which is sometimes referred to as the bare area. The cartilage is smooth and the synovium is a single-cell layer. In both C57BL/6 (C and D) and FcγR−/− (E and F) K/BxN sera-treated mice, a hypercellular synovium and bone erosions (arrowheads) were noted. The scalloped edges of the synovium invading the bone can be seen. Damage to the cartilage (thin arrows) was seen in the C57BL/6 group (G) and to a lesser extent in the FcγR−/− mice (H). In G, synovium is seen directly overlying the cartilage. A, C, and E are ×100 original magnification and B, D, and F are ×400 original magnification of approximately the same area. G and H are ×400 original magnification views of different areas. For orientation, the s overlies synovium, b designates bone, and c indicates cartilage. An interesting topic of discussion is why the arthritis is the only major disease manifestation in this model. FcRs present on synovial fibroblasts and extracellular matrix have been described previously (17, 18, 19, 20). To evaluate whether joint inflammation is associated with bone marrow-derived elements or with other connective tissues, bone marrow chimeras were made by irradiating C57BL/6 and FcγR recipients and reconstituting them with FcγR and C57BL/6 donor bone marrow, respectively. After 8 wk, the animals were bled and checked for bone marrow engraftment. The chimeras and unmanipulated control mice were injected with pooled K/BxN sera. The development of arthritis required the presence of FcγR on bone marrow-derived cells and not on synovial fibroblasts, which should be less radiation sensitive (Fig. 4⇓). FcγR on bone marrow-derived elements is critical for arthritis. Adult C57BL/6 and FcγR−/− mice were irradiated and reconstituted with FcγR−/− bone marrow (□) and C57BL/6 (○) bone marrow, respectively. They were injected along with unmanipulated C57BL/6 (•) and FcγR−/− (▪) control mice with 150 μl of pooled K/BxN sera i.p. on days 0 and 2. Arthritis was clinically scored (A) and ankle thickness was measured with a caliper (B). The means of four mice per group ± SEM are shown. The joint inflammation following the adoptive transfer of KxB/N serum is reminiscent of an Arthus reaction, an analogous disease associated with immune complexes (21). Mast cells play a dominant role in a passive cutaneous Arthus reaction (22, 23), and they are also present in the synovium of normal and K/BxN mice (Fig. 5⇓, A–D). W/Wv mice have a mutation affecting the c-kit tyrosine kinase receptor, which is necessary for normal mast cell maturation, proliferation, and survival (24). As a result, these mice virtually lack tissue mast cells (25, 26, 27). These mast cell-deficient mice were injected with pooled KxB/N sera and observed for the development of paw swelling. Compared with control animals, these mice had markedly attenuated arthritis (Fig. 5⇓E). Furthermore, mast cell-deficient mice that were reconstituted with bone marrow-derived mast cells developed an intermediate course of arthritis. K/BxN serum-transferred arthritis is partially mast cell dependent. The hind paws of wild-type (A and B) and K/BxN (C and D) mice were fixed in Formalin, joints were decalcified, and embedded, and tissue sections were stained with toluidine blue. Mast cells notable for the dark staining granules were visualized in the synovium (original magnification, ×100 in A and C). The mast cells designated with the arrowheads are further magnified (original magnification, ×400 in B and D). E, Adult K/BxN mice were bled and the sera were pooled. Adult mast cell-deficient WBB6F1-W/Wv mice (•), WBB6F1 controls (▪), and WBB6F1-W/Wv mice reconstituted with mast cells (▴) were injected with 100 μl of pooled sera on days 0 and 2. Arthritis was clinically scored and ankle thickness was measured with a caliper. The means of three to four mice per group ± SEM are shown. ∗, greater paw swelling in WBB6F1 than in the W/Wv mice, p < 0.05 by Student’s t test). Much interest has been engendered by the KRN model of spontaneously occurring erosive arthritis. In this model, T cells bearing a single autoreactive TCR escapes negative selection in mice bearing a specific MHC class II allele, IAg7 (1, 2, 3, 28, 29). In the periphery, these T cells promote a breach in B cell tolerance and high levels of anti-G6PI are produced (3, 29). As anti-G6PI autoantibodies accumulate in the serum, a destructive and erosive arthritis similar to that seen in human rheumatoid arthritis was observed. The adoptive transfer of sera from these mice results in peripheral joint swelling in most recipient strains (2, 4). This adoptive transfer model allows the study of end-effector mechanisms in multiple strains of mice simultaneously (15, 30). Early events that trigger paw swelling in the serum transfer model include signaling through FcRs (5, 7). In this study, FcγRIII is predominantly, but not entirely, responsible for the joint swelling seen in the adoptive transfer model. Although no swelling developed in the FcγR-deficient mice, another receptor that shares the common γ-chain, FcγRI has been reported not to influence the development of inflammation in this model (7). In contrast, FcγRII signaling suppresses joint swelling, which may be dependent on genetic background (4). A previous report mapped the genetic loci of one pair of responder/nonresponder (C57BL/6 × NOD)F2 mice that conferred susceptibility to K/BxN serum-transferred arthritis. Two genomic regions were found to be major determinants with additive effects. The region on chromosome 2 was centered on the C5 locus, but the region on the distal arm of chromosome 1 was broad and contained many attractive candidate genes including FcγRII. In this study, FcγRII-deficient mice which were (129 × B6)F2 did not have an accelerated course of arthritis. Clearly, there are multiple gene effects in the susceptibility to serum-transferred arthritis and the influence of a single gene in mice with a mixed genetic background can be muted. The development of arthritis as the selected target in this model of immune-mediated disease is of great interest. Anti-G6PI Abs rapidly localize to the joint and an immunohistological study revealed the accumulation of extracellular G6PI along the cartilage surface (31, 32). The normal synovium is relatively hypocellular, containing only a lining of synoviocytes and a sublining with fibroblasts, connective tissue, and blood vessels. Various cells expressing FcRs are present in joints. Reports of FcR expression on fibroblast-like synoviocytes led us to examine the role of joint-associated FcγR expression in the serum transfer model (17, 18, 19, 20). The experiments with the chimeric mice show that the development of arthritis depends on the expression of FcγR by bone marrow-derived cells, which may include mesenchymal stem cells (33, 34). Neutrophils are heavily recruited into the joint and have been described as crucial to the development of arthritis in the serum transfer model (6). Other cells that express FcRs include macrophages, B cells, and mast cells. Macrophages and monocytes are probably less critical in the acute paw swelling, but may be more prominent in the chronic phase (35). Increased numbers of mast cells are found in the synovial tissues and fluids of patients with RA and at sites of cartilage erosion (36, 37). Mast cell activation and degranulation results in the release of potent mediators, including histamine, heparin, proteinases, leukotrienes, and multifunctional cytokines. In the K/BxN passive transfer model, the arthritis was diminished in mast cell-deficient mice compared with controls. The currently available data suggest a model whereby synovial mast cells are stimulated by passively transferred Abs and degranulate, causing vascular permeability and recruitment of inflammatory cells, predominantly neutrophils, into the joint. The acute phase requires complement and the correct balance of signaling through FcR family members (4, 5, 7). A more indolent and subacute process, not dependent on FcR signaling or paw swelling, is marked by articular erosion. The pathogenesis of this long-term complication is unclear. The mechanisms for inflammation may also be separate from those for bony erosions (38). Disruption of TNF-related activation-induced cytokine/receptor activator of NF-κB ligand signaling abrogates bony destruction despite active joint inflammation (38). In a RA treatment study with anti-TNF Ab, joint injury as seen on radiographs did not progress over 52 wk in the treated group, regardless of whether inflammatory measures improved or not (39). Other reports also describe the dissociation between clinical improvement in RA patients and progression of bony erosions and cartilage loss (40, 41). Murine models of chronic and destructive polyarthritis suggest that synovial fibroblasts can be injurious in the absence of T and B lymphocytes. For instance, Rag-1-deficient DBA/1 mice immunized with collagen develop synovial hyperplasia and joint destruction, despite minimal articular inflammation (42). Furthermore, mice with a deletion of the 3′ regulatory element of the TNF-α gene when bred onto a Rag-1−/− background still developed chronic and progressive joint destruction, implying that stromal elements and/or synovial fibroblasts play a central role in this model (43). The differences between mouse models of arthritis and human RA have to be considered. Each model, however, may provide clues to the mechanisms of the induction, inflammation, and destruction seen in the human disease. We thank A. Betancourt, S. Wu, P. Charos, N. Noon, and J. Uhle for their assistance. We are grateful to Drs. D. Mathis, C. Benoist, and J. Ravetch for their generous gifts of mice and to Drs. N. Zvaifler, C. Ciesielski, G. S. Firestein, and D. Carson for helpful discussion and critical reviews of articular sections and this manuscript; Drs. Diana Marquardt, Stephen Wasserman, and Ravi Malaviya for their helpful advice regarding mast cell cultures and reconstitution; and Drs. Jae Youn Cho, David Broide, and Jung Y. Cho for assistance with photomicroscopy. ↵1 This work was supported by Grants AI10682, AR44850, and AR47360 from the National Institutes of Health. ↵3 Abbreviations used in this paper: RA, rheumatoid arthritis; G6PI, glucose-6-phosphate isomerase.